Now, I know Halloween isn't a tradition that is widely celebrated here in Australia, but it's popularity has progressed somewhat over the years. During a visit to my local supermarket the other day, I noted that the Halloween 'jack-o-lanterns' carving pumpkins were on sale - something you never would have seen when I was a child. The few who did choose to carve pumpkins had to make do with the traditional Jap or Queensland Blue varieties. That said, I do remember when I was a young child, Girlfriday and I did partake in several years of 'Trick-or-Treating' around our local block, usually with one of our parents in tow. We would usually bypass the red brick house half way down our street as it was home to the mean chihuahau dog that used to chase us whenever it got the chance. I know they are small, but boy were we scared of this one! Most of the houses in our street were generous when it came to filling up our lolly bags, it was a lot of fun and our costumes involved some variation of the traditional ghost - white sheet with holes cut out of it. I'm sure kids costumes these days are far more elaborate. One year, we knocked on the door of this one house in our street where an elderly man lived alone, we were a little scared as he was somewhat of a recluse and through the eyes of a child, he looked a little mean. This night, he opened the door and we echoed the words 'trick-or-treat' . He mumbled something and told us to wait. He was gone a while, only to come back with two bananas. "Here you go" he said,giving us one each before shutting the door. Being kids we wanted lollies! Fast forward to 2011 - little had we known that the old banana would become the luxury item it has today. (For those of you reading this outside Australia - 75% of our banana industry here in Australia was affected by a tropical storm earlier this year which pretty much wiped out our supply and sent prices skyrocketing). I personally love Halloween and all it's associated activities. Particularly those surrounding spooky looking foods. 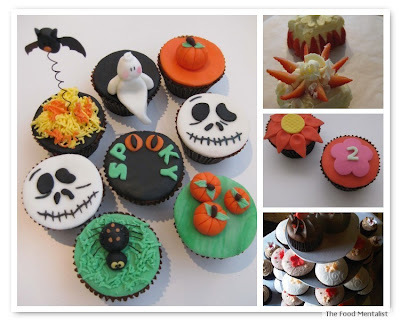 Last year, I made some spooky cupcakes and featured them in my Top 10 Cupcakes post earlier this year. 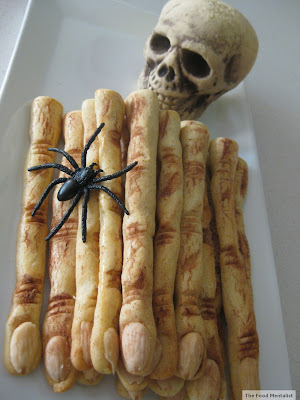 For this Halloween however, I was inspired by Louise from Cake Journal who made some Halloween dead finger cookies. They look amazing and so I have made some this year too. I took them into work and shared them with my colleagues. What I love about this recipe is that they are super fun to make, look amazingly real and fit the 'spooky' Halloween brief really well. 20-30 blanched almonds ( skin removed), cut into halves. 1. In a bowl add the two types of sugar, vanilla extract, a pinch of salt and the egg + yolk. Stir well with a wooden spoon. 4. Take the dough and knead it lightly. Wrap it in plastic wrap and chill in the refrigerator for 1 hour. 1.Take a small piece of cookie dough (walnut size) and roll it back and forth. You should make the finger long and thinly (think, witch long and creepy) for best results. Pinch to form knuckles. Use your knife to score 'wrinkles' into the finger and transfer the fingers to the prepared baking tray. 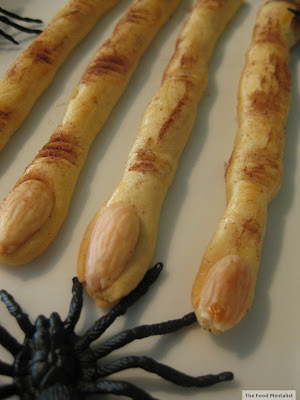 Brush the cookies with the leftover egg white and place a almond “nail” on the cookie fingers. Chill for 15 minutes in the refrigerator. 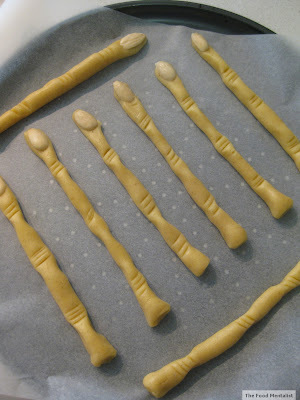 2.Next, place the baking sheet in the middle of the oven and bake the finger cookies for about 12-15 minutes. They should be just lightly browned. ( If are using a fan forced oven the cookies will only need about 10 minutes. Just be sure to keep an eye on them). 3. Transfer to a cooling rack and cool completely. 4. Dust the fingers with a little cocoa powder and your spooky finger cookies are ready to be served. Tell me, do you celebrate Halloween? What spooky recipes or events will you be enjoying this year? These look great! I'm not big on Halloween but for the past few years we have been enjoying Halloween in Hong Kong, no one does it as well as them! The street parade rocks - I would love to take some of those fingers with us to point at good costumes and munch on in between! They look awesome, good job! These are soooo freaky! I cant believe how real they look,do not want to wake up and see one of those on my pillow on Halloween! 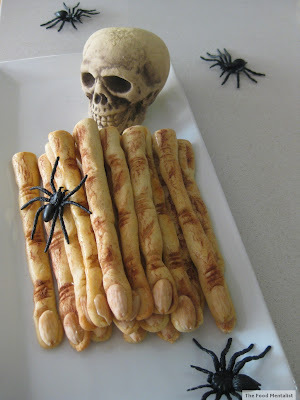 These are amazing, absolutely perfect for Halloween or any scary party! 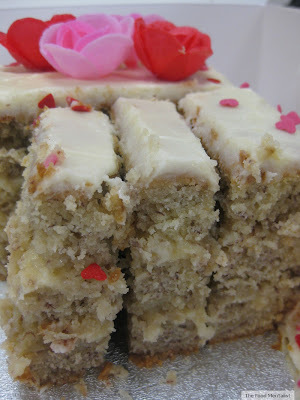 Your fingers look frighteningly delicious! 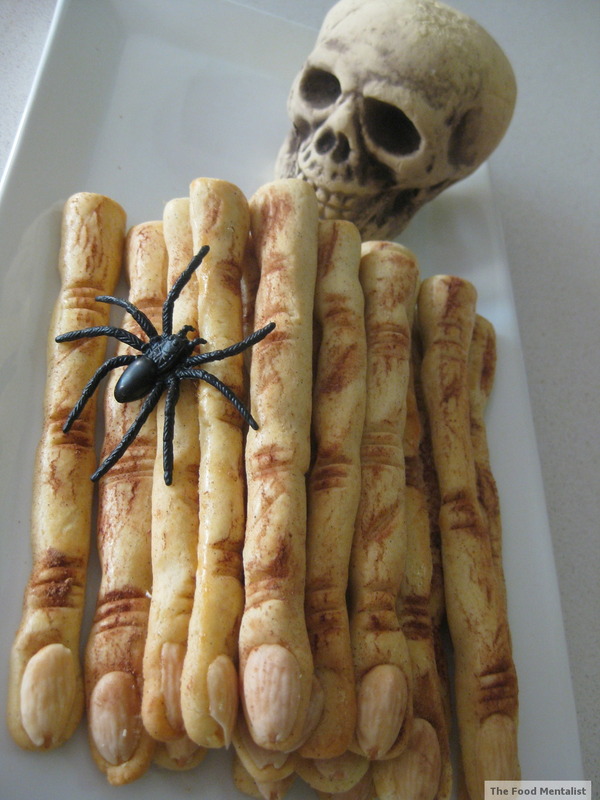 Love that you celebrate Halloween in Oz. I really wanted to do something for Halloween this year but plans got put on the wayside :( But at least I can celebrate with posts like this - great job on the spooky fingers! I should've gone to your house to trick or treat! Yikes!!! These are freakishly life-like. I think my kids would be scared to touch them. Great work! You did an amazing job! They are freaky :) I did the pumpkin carving this year as long with a dummies guide on the old blog. My first year and probably my last for now. $35 a pop for a pumpkin that you can't eat is a rip! I don't know if I would be able to eat those little fingers, they look too real!